So, yesterday we learned that Doctor Who will return on March 30, 2013 as part of BBC America’s Supernatural Saturday block. We’ll get 8 new episodes penned by the very best in show writing and in Who legacy. But what happens next? 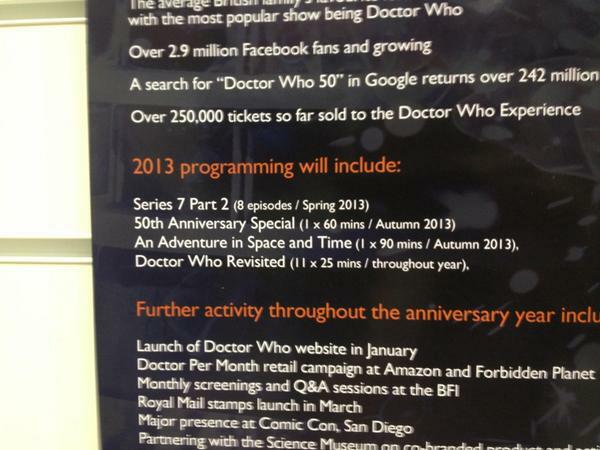 What will the 50th Anniversary hold? Agreed! Christmas just ins’t so without The Doctor. Hmmmm… they wouldn’t do that, would they? An article from the Birmingham Mail claims that current Who star Matt Smith will be joined by his seven surviving predecessors. Tom Baker, Peter Davison, Colin Baker, Sylvester McCoy, Paul McGann, Christopher Eccleston and David Tennant are all said to be appearing in the November one-off. In addition, the report claims that the Steven Moffat-penned episode will use “studio trickery” to include appearances from the first three Doctors – played by the late William Hartnell, Patrick Troughton and Jon Pertwee. The BBC is yet to confirm any official plans for the Doctor Who special, which will mark 50 years since the sci-fi drama’s first transmission on November 23, 1963. I have a feeling we’ll be getting more and more rumors and no facts until we get really close to the air date. Still, it’s fun to imagine all 11 Doctors solving a crisis. I think the term would be, NERDGASM. We’ll be keeping a close eye on this one as more and more info is released. What are your thoughts for the Anniversary? Can you live without The Doctor on Christmas? This entry was posted in Doctor Who, TV and tagged Doctor Who, Doctor Who 50th Anniversary, Doctor Who Series 7, Jenna-Louise Coleman, Matt Smith, Steven Moffat. Bookmark the permalink. Wish I could read this stuff. But my timeline has not yet caught up with the Doctor’s, and I hate spoilers. FWIW, I’m about to watch the finale of Series 4 and am giddy with excitement.